In the summer of 2014, Selby Gildemacher, Anja Groten, and I were asked to curate the last week of a 10 week festival about ‘Lightness’ in Mediamatic. As we would be the grand finale of this series of exhibitions we wanted to create a spectacular event where people could enjoy art through entertaining attractions. 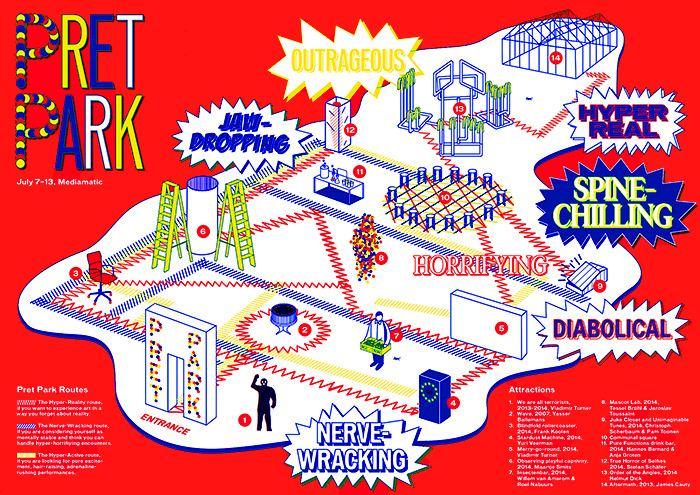 ‘Pret Park’ (amusement park) is an art exhibition filled with superficial experiences as a method to talk about the value of sensationalism and entertainment in the cultural sector. On February 1, 2014 the solo exhibition of designer Marcel Wanders opened in the Stedelijk Museum in Amsterdam. An unexpected move, since the Stedelijk is known for exhibitions by cutting-edge artists like Mike Kelley, Steve McQueen, and Aernout Mik. Although Marcel Wanders is well-known and commercially successful, he is not considered relevant in the design world by most standards. When the magazine Vrij Nederland reported that same year that Wanders had donated €500.000 to the Stedelijk museum, both parties denied any relation between the donation and the exhibition. 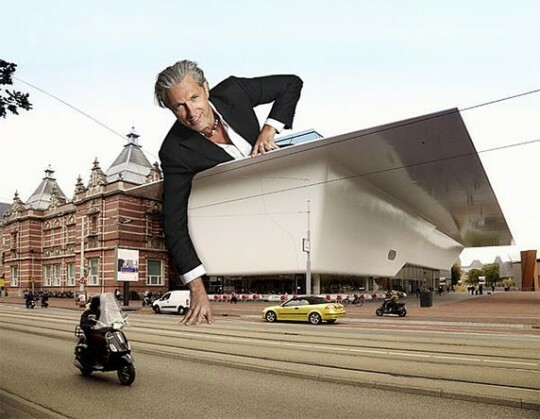 Above all, this exhibition in the Stedelijk is exemplary for the flirtatious behaviour of high brow art institutions with celebrities to boost visitor figures. 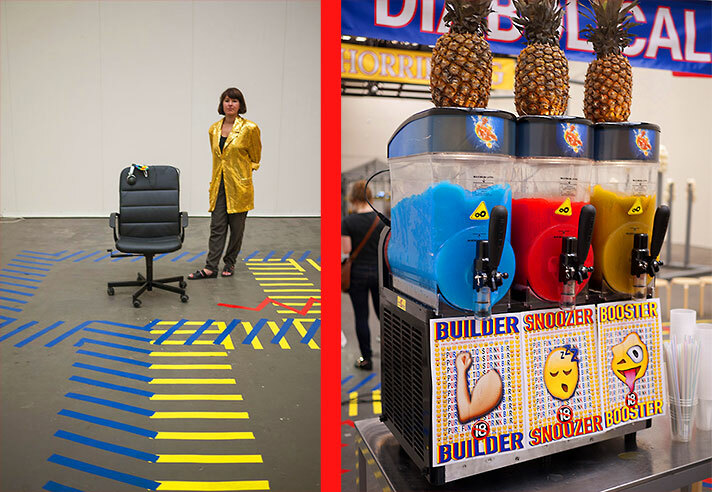 The art world has a complex relationship with the spectacle. On the one hand we see a rise in blockbuster exhibitions, celebrity artists, and luxurious art fairs. On the other hand there is a lot of criticism as well about the influence of the entertainment industry and commerce in the art world. The Turbine Hall at the Tate modern is meant to display large spectacular works by artists like Anish Kapoor, Olafur Eliasson, and Ai Weiwei. Works sponsored by Unilever, created to overwhelm us with awe. The public wants to see spectacle, and expects no less in an art exhibition. 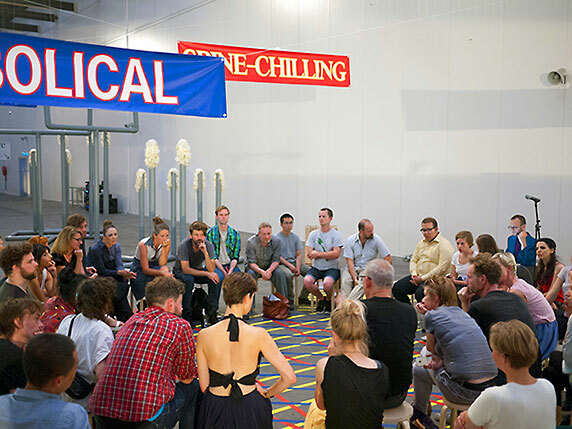 The Dutch government encourages spectacle through its new arts funding policy. Minister of Culture Bussemaker has argued that publicity reach and visitor figures should play a larger role in public funding of art. This is the next step in quantifying the experience of art. An artistic vision is no longer enough to apply for funding. There needs to be hard evidence that visitors will line up to see this exhibition. Pret Park loves spectacle for all the right reasons, but we are critical as well. If art is forced to adapt to the ‘attention economy’, how can we expect to preserve its transformative and critical role? 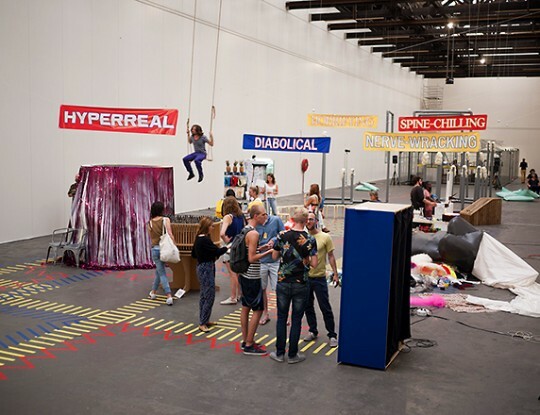 Pret Park created space for artists and the public to investigate the concept of ‘lightness‘ and the spectacle, and its possibilities. There is no spectacle without the spectator. 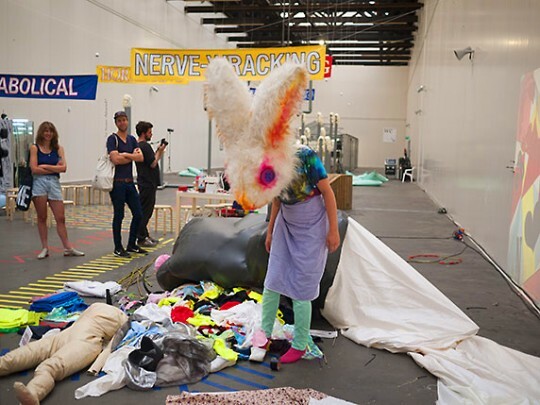 We asked the participating artists to turn Pret Park into a hyperreal landscape in which visitors get scared, amazed, lost, energized, disappointed, moved, curious and confused. 13 artists worked together to help create an amazing event for which many artworks were especially made for the exhibition.